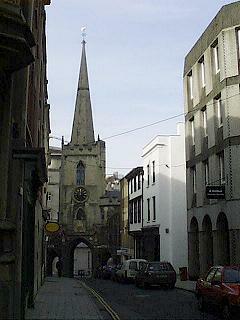 The present church dates from the 14th century, and the city’s North Gate forms the lowest stage of the tower and spire. The building of St John’s coincided with a period of great prosperity for Bristol. Walter Frampton (died 1388), who was mayor of the city three times, founded the church, and his splendid monument stands in the chancel. His effigy lies on a tombchest decorated with heraldic shields, with a long-tailed dog at his feet. Other monuments in the chancel, and in the early 14th century vaulted crypt beneath, testify to the wealth and business activity of the city, in mediaeval times and later. See, for example, the alabaster tomb in the crypt of a merchant and his wife, with their ten children represented in panels below. 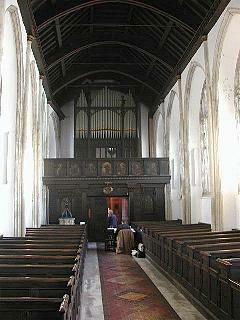 The interior of the church is impressively tall and graceful, with fine fittings dating mostly from the 17th century. Christ Church, known in the twelfth century as Holy Trinity, was one of the three crossroads churches - the others being St Ewen's and All Saints - but lies at the apex of the north-east quadrant and may therefore represent an extension northwards from the probable (?tenth-century) planned Anglo-Saxon town. A fair was held at the feast of Holy Trinity in the twelfth century at Bristol, where the church of Holy Trinity, with Norman, if not Saxon fabric, is recorded from 1147. The 18th century was a time of change. Christ Church, which had existed for hundreds of years on this Wine Street/Broad Street corner, was demolished and a new church built on the site to William Paty's design. The nearby church of St Hoyan or Ewen in Corn Street had been closed, (it was pulled down in 1820 for the Council House) so that dedication was combined with it. Hence the rather clumsy title of Christ Church with St Ewen. 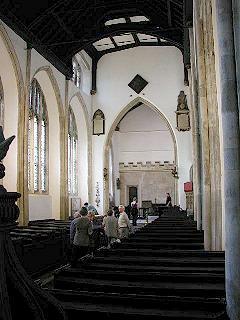 The interior of the church has a particularly fine gilded ceiling. The organ was recently rebuilt. See the Churches Conservation Trust web site here. 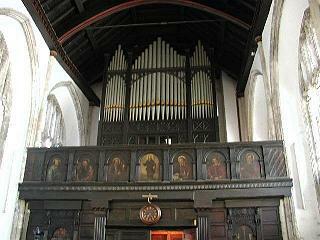 Bristol, Bristol, St John Bapt, (St John on the Wall), 6, 11cwt in F.